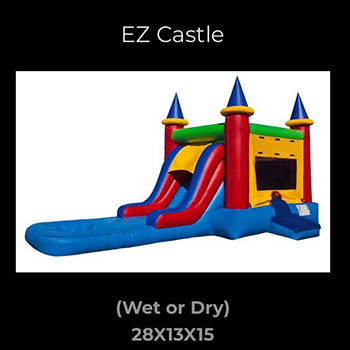 Rent the Deluxe EZ Castle for four (4) hours of fun for half price!!! Buy yours and book now at 808-674-0297!! We are a family owned and operated business. We specialize in Bounce Houses and Water Slide rentals. We try to offer the most affordable prices for everyone. Unlike our competitors who sky rocket their prices. Customer service is our upmost priority and catering to every aspect that involves renting with us. The hardest part you have to do with us is book, which is very easy. We do the rest from delivery, setup, take down, and cleaning. You do nothing but enjoy your party and relax! Good towards four (4) hours rental of the Deluxe EZ Castle. Drop off and pick up is included. Call ahead to reserve, based on availability.